GBW32 V5. 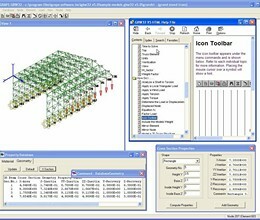 0 is a 3D Finite Element program that uses truss and beam elements to model a wide range of Mechanical and Civil structures. 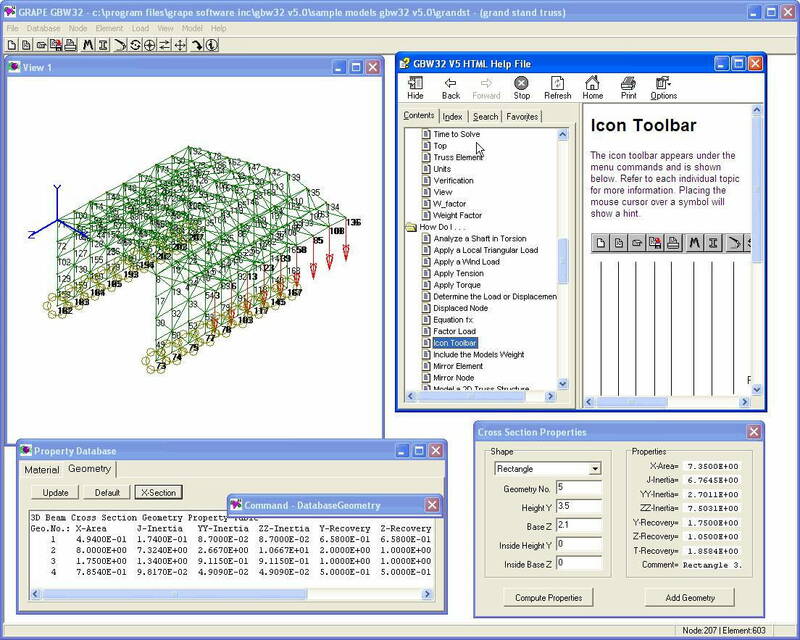 The graphical user interface is powerful and easy to use to quickly model a structure, apply loads and constraints, and analyze the model. GBW32 supports release nodes for all loadings, batch analysis, auto analysis, has an undo/redo feature and a built in property section calculator. Displacements, loads, stress information and animation are available to determine the effect of the applied loading and constraints. Results can be viewed with a few mouse clicks. Models can be imported/exported as a DXF file. Model, material and geometry files are ASCII text and can be created/edited within the program or from another source. Loads available include global loads and moments at nodes, global uniform loads, acceleration and angular velocity. Local element loads include trapezoidal loads, axial, torsion, moment and thermal loads. Constraints or springs to ground can be applied in all 6 degrees of freedom. Models can be created within the graphical environment or imported as a DXF file. When the software is downloaded and installed it runs as a COMPLETE software package with NO RESTRICTIONS. The software can be registered at any time. If the software continues to be used it must be registered. * Grape GBW32 download link provides free for non-commercial use version of the software. Easy to use 3D truss analyzer using finite element methods. It has an easy graphical interface where you can define, loads, nodes and elements. Aimed at solution of complex solids with realistic and advanced boundary condition simulations using either the integrated solver or a choice of several other well known solvers which can be run seamlessly within the program environment. Phase2 is a powerful 2D elasto-plastic finite element stress analysis program for underground or surface excavations in rock or soil. Analysis3D calculates two- and three-dimensional Trusses and Frames. These structures consist of long slender Members that are supposed to behave linear elastic. Gmsh is a 3D finite element grid generator with a build-in CAD engine and post-processor. Its design goal is to provide a fast, light and user-friendly meshing tool with parametric input and advanced visualization capabilities. Grape GBW32 has been rated 5.0 out of 5 points. A total of 1 votes cast and 0 users reviewed the software.